dental decay. If either is the case, it is important to know the benefits of using a space maintainer and how it can help support your child’s dental health. A space maintainer is an appliance that is custom-made by a dentist or orthodontist in acrylic or metal material. It can be either removable or cemented in a child’s mouth. Its purpose is to keep the space open to allow the permanent tooth to erupt and come into place. Baby teeth are important to the development of the teeth, jaw bones and muscles and help to guide permanent teeth into its right position when the baby teeth are lost. If a space is not maintained, then teeth can shift into the open space and orthodontic treatment may be required. Not every child who loses a baby tooth early or due to dental decay requires a space maintainer; however, a professional consultation with your dentist or orthodontist should be conducted to determine if using a space maintainer is needed. 1. 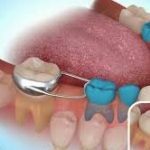 Removable – removable space maintainers are similar to orthodontic appliances and are usually made of acrylic. In some cases, an artificial tooth may be used to fill a space that must remain open for the unerupted tooth. The unilateral and crown and loop space maintainers are placed on one side of the mouth to hold space open for one tooth. In the unilateral space maintainer there is a band that wraps around of the tooth from outside and is connected to a metal loop that holds the space intact. The crown and loop is an actual crown that covers the tooth and is attached to the loop that holds the space intact. The Distal Shoe Space maintainer is usually used for an unerupted First Permanent Molar tooth. It is a more complicated space maintainer because the end of the metal is usually inserted into the gum line to keep the open space from closing. A dentist will need to monitor the progress of the erupting permanent molar to make sure it can erupt properly with this space maintainer. Once the space maintainer is made by the dentist or orthodontist, it may take the child a few days to get accustomed to wearing the appliance whether it is removable or fixed. The dentist should review with the child and parent the proper ways to clean the space maintainer thoroughly in order to keep the gum tissue healthy and free of dental plaque. Proper instruction for tooth brushing and flossing should be considered for improved oral hygiene.